We had our annual Tribe party at the winery yesterday, and it was another wonderful event. In the course of the party, a number of Tribe members asked me what I thought about the quality of this year’s vintage. We’re still in the midst of harvest with five grape varieties yet to be picked, so it’s too early to be definitive, but here’s how I responded to the questions at the party. Spring-type weather came early this year in Sonoma County. The buds on many grapevine varieties were pushing out in February, which is at least a month early. In my experience, this can be a very good thing — at least so long as it is not followed by hard frost! We did not get such a post-bud-break frost this year, and the spring weather continued generally cooler than normal. As a result, the grapes had a longer-than-normal “hang time” going into summer. In the opinion of many winemakers, longer hang time is beneficial because the grapevine roots have an extended opportunity to pump desirable favor elements into the grapevines and, most importantly, into the grape clusters. So by the end of spring this year, Lucas and I were optimistic that we were headed for a high-quality vintage. But then things changed even more! If during July of this year you had asked us when we expected harvest to begin for the red varieties that we use to make our “big reds”, we would have replied that we expected harvest to be well underway by the second half of August, and finished by mid-September. But then our weather took another positive winemaking turn. All of August was quite a bit cooler than normal. Indeed, it was the coolest August in Sonoma County I’ve ever experienced since Molly and I bought our first Dry Creek Valley vineyard in February 1977. This cool weather further extended the hang time of the grapes this year. Rather than having the “big reds” harvest starting in mid August (as we had predicted during July), they were delayed for approximately another month. 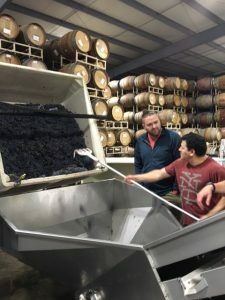 At our winery we did not begin crushing grapes for our red wines until mid-September, and we don’t expect to be finished with harvest until mid October. As a result of these unusual factors, the grape hang times this year have been much, much longer than normal, and we are optimistic that this will result in a vintage of very high quality red wines. We should know more about this by early next year when the grapes have finished fermentation and the resulting wines have had a few months to settle down in the barrels. We’ll keep you informed! While I have your attention, I would like to report one other fun and tasty development. Over the years since we began our winery in 1984, we have tried to set aside cases of each of our red wines for our winery library. In theory, our theoretical goal was to send 20 cases of each wine to the wine library, but until 2014 when we moved the winery to Healdsburg, we never did a good job of keeping track of our wine library. Then, when we moved, for the first time we did a comprehensive listing of what the library contained, and we realized that in a number of instances fairly large amounts of wine had been put into the library storage area. We are in the process of tasting many of the library wines, and we plan to offer a number of them for sale to members of the Tribe. Indeed, we opened several library wines at the party yesterday, and they were very well received. Last night, after the party, Molly and I went to a Healdsburg restaurant to have dinner with a Tribe couple from outside California who are great friends of ours. We took along a bottle of 2001 Meeker Four Kings, and it was absolutely fantastic. Lucas reports that there is an unusually large quantity of this wine in the library, so you will no doubt be hearing more from us in this connection. Our family sends our very best wishes to you and all of yours for a fantastic fall and holiday season!